Arp 299 is a pair of galaxies (IC 694 and NGC 3690) in Ursa Major about 134 million light years from Earth. These galaxies have been interacting, that is colliding, and in the process creating a massive black hole. 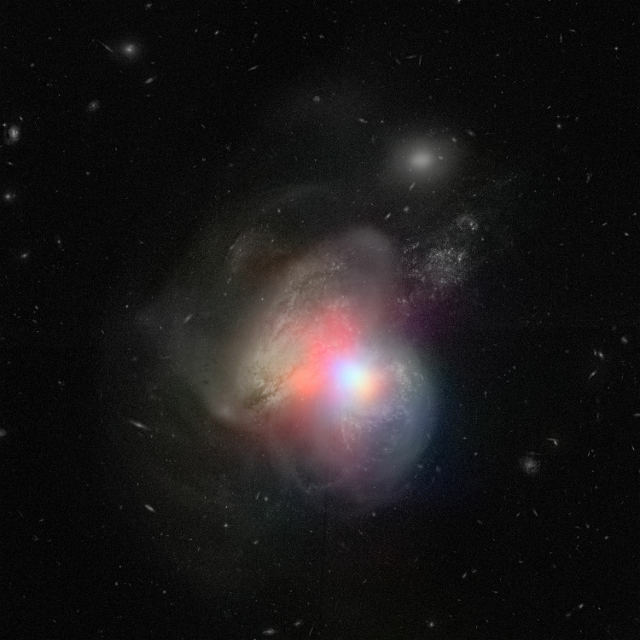 This composite image from NASA/JPL used data from both NuSTAR and Hubble. NuSTAR is able to capture and measure the high-energy X-rays that are being emitted by Arp 299, with the 4 to 6 kilo-electron volts appearing as red, energies of 6 to 12 kilo-electron volts being green, and 12 to 25 kilo-electron volts as blue. This is thanks to a large black hole that is consuming gases at a very high rate and releasing the X-rays being measured. This composite image combines data from NASA’s Chandra X-ray Observatory and its Spitzer Space Telescope shows the massive black hole in this distant galaxy, NGC 4258 and the radio jets. 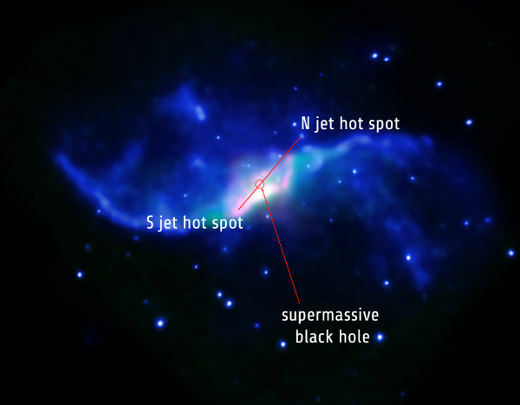 The blue portions of the image are from the x-ray data provided by Chandra while the red and green represent the infrared emissions from hydrogen molecules observed by Spitzer. The x-ray and hydrogen emissions are believed to have been caused by shocks which are close to a sonic boom – except from a supersonic plane. 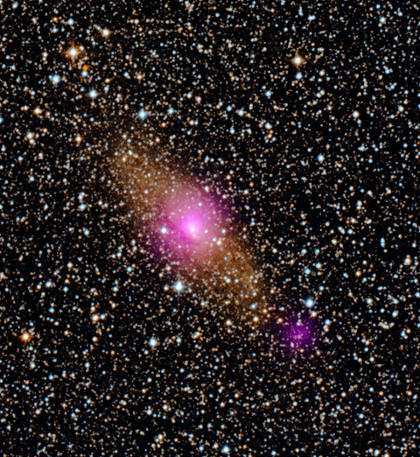 The two purple/magenta coloured spots in this picture show a massive black hole in the center of the Circinus Galaxy and a smaller black hole beside it. The smaller black hole belongs to a class called ultraluminous X-ray sources, or ULXs. It was what lead to this discovery, where the larger black hole is believed to be around one hundred times the size of our Sun. The Circinus galaxy is located about 13 million light years away from Earth in the Circinus constellation. The X-ray data came from NASA’s Nuclear Spectroscopic Telescopic Array (NuSTAR) mission managed by JPL-Caltech.